Radcliffe graphic designer Jessica Brilli's artwork will be on display in the Gutman LIbrary Nov. 3-25. This piece, titled "Voss," is among a series of still-life images of everyday items from the 1940s, ’50s, and ’60s. “I just feel really lucky to be able to do something creative at work," said Brilli. "I love doing both — I love painting, and I love doing graphic design." Most people would say that being able to do something they love for eight hours a day, five days a week, is a rare gift. For Jessica Brilli, it’s an everyday reality. The graphic designer uses her passion for art to inform the visually alluring material she creates for Radcliffe’s Institute for Advanced Study. And when she’s not at work, she is often at home in her studio creating whimsical and evocative oil paintings. The fruits of Brilli’s professional and personal labors are around every corner in Fay House, Radcliffe’s newly renovated airy office and meeting space. On a hallway table, publications, fliers, and brochures that announce institute programs and lectures beckon passersby, displaying Brilli’s creative designs. Next to Brilli’s desk on the building’s sunny third floor, a giant image of a reclining Julia Child smiles casually back at the viewer. The picture is part of a promotional poster she designed for the institute’s recent symposium on the iconic chef. “Pretty much anything visual here, I had something to do with producing,” said Brilli, a New York native who began her Harvard career helping to design The Harbus, the independent, student-run newspaper at the Harvard Business School. She made the jump to Radcliffe in 2004 and worked as a production coordinator before transitioning to graphic designer in 2010. The products of Brilli’s other artistic talents adorn the building’s walls. On its second floor hangs her painting of July 4 fireworks exploding over a rooftop in Boston’s Back Bay. 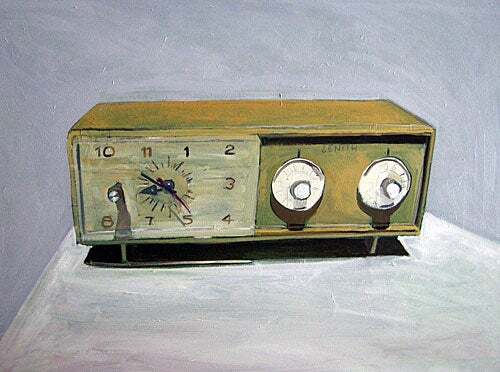 Just down the hall, Brilli’s work “Zenith,” showing an old clock radio painted in soft gray and blue hues, decorates the office of Radcliffe Dean Lizabeth Cohen. Brilli scours flea markets and eBay for items of inspiration, such as this 1942 Kodak Baby Brownie Special camera. More of Brilli’s artwork will go on display Nov. 3 in the Harvard Graduate School of Education’s Gutman Library. 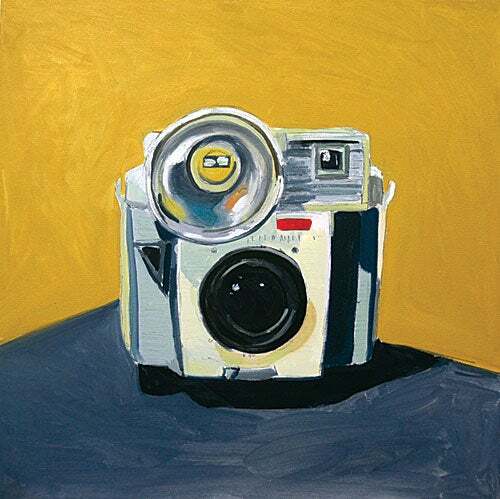 The show, which will be on view through Nov. 25, will feature 10 works from her collection titled “Static,” consisting of a series of still-life images of everyday items from the 1940s, ’50s, and ’60s, such as typewriters, telephones, and radios. Her attachment to old radios provided inspiration for the new show. “I’ve always loved them. They are beautifully designed objects,” said Brilli, who bought her first classic radio, a 1940s Philco, on eBay several years ago. One radio painting led to another. 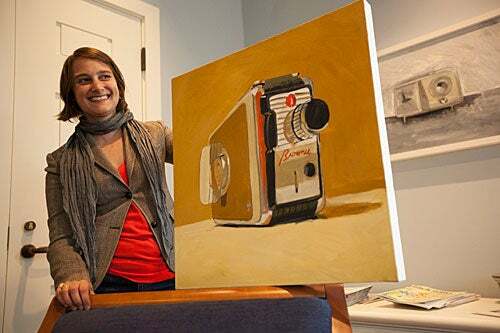 Soon, she also started capturing images of old cameras on canvas. “These were still lifes of these dormant objects, and I realized I could make it a much bigger, broader thing, so I just kind of went for it.” A local weekend flea market became her regular haunt. There she scoured the stalls for her new “subjects,” like a 1942 Kodak Baby Brownie Special camera, and a baby blue Smith Corona typewriter from 1960. “I’ve always loved them. They are beautifully designed objects,” said Brilli, who bought her first classic radio, a 1940s Philco, online. Interested in drawing and painting from a young age, Brilli attended the University of Rhode Island, where she earned a degree in fine arts. Like many an undergraduate trying to find her way, she experimented artistically. She found watercolor paint too finicky, and that acrylic paint “dries too quickly.” So she turned to oil paint, which hardens more slowly, and allows an artist the flexibility to change her mind. That self-awareness extends to Brilli’s workplace, where she feels fortunate to be able to combine passion with job seamlessly. “Static,” works by Jessica Brilli, will be on exhibit at the Monroe E. Gutman Library, Harvard Graduate School of Education, Nov. 3-25. An artist’s reception will be held from 5:30 to 7 p.m. on Nov. 8. Roger Chartier's work examines the history of books, publishing, and reading, with a recent focus on the intersection of written culture and literature.